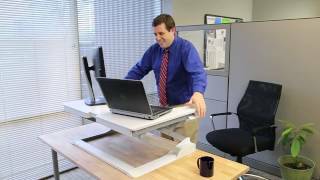 Ready to use straight out of the box at your current desk, the Ergotron WorkFit T Sit-Stand Desktop Workstation is the ideal all-in-one system to keep you working in better postures for your body. To transform your desk, simply set on top, raise and lower to your height preferences for an easy way to upgrade your office for better ergonomics with one major desktop annexation. This model is made to fit in smaller, narrower spaces around the office, giving you ergonomic options even when space is lacking. Total weight capacity 10-35 lbs. The Ergotron Workfit T Sit-Stand Workstation is available with your choice of either Black or White allowing you to easily match the look of your office! $459.00 List Price: $765.00* The list price is the same as the MSRP (Manufacturer's Suggested Retail Price). It may not necessarily be the price at which the product is sold. Ergotron WorkFit-T: It’s So Simple!